Did you know that computers and other electronics can’t be recycled the same way as traditional recyclable items? Electronics fall under a category called electronic waste, or e-waste. Hard Disc Drives fall under the category of e-waste, and must be destroyed in an environmentally sound manner. The United States Environmental Protection Agency states that electronics that are not disposed of properly pose risks to human health or the environment if mismanaged at their end of life. Hard Disc Drives in particular have many different components to them, most of which need to be disposed in different manners. The inside of a hard drive contains magnetic components, plastic, glass, tin, gold, lead, and many other metals which are extremely harmful to the environment. Recycling electronics helps reduce pollution that would be otherwise be produced while making brand-new electronics or mining for elements used to make those electronics. 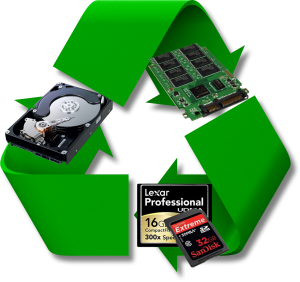 Here at Platinum Data Recovery, we take the effort to stay eco-friendly and recycle each individual part of the hard drive separately. First, we remove the Printed Circuit board, or PCB. If not disposed of correctly, PCBs omit air emissions and discharge into bodies of water. If disposed of properly, one metric ton of circuit boards can contain 40 to 800 times the amount of gold found in one metric ton of raw ore. Next, we open the cover of the hard drive to reveal the platters, drive heads, and voice coils. We remove the platters from the drive and destroy each one physically, allowing the data that remains on the platters to be destroyed and lost forever. The drive heads, voice coil magnets, and other components of the drive will also be disposed of properly, with no adverse effect to the environment. By recycling your hard drive with us here at Platinum Data Recovery, you can rest assured that you have helped the environment.